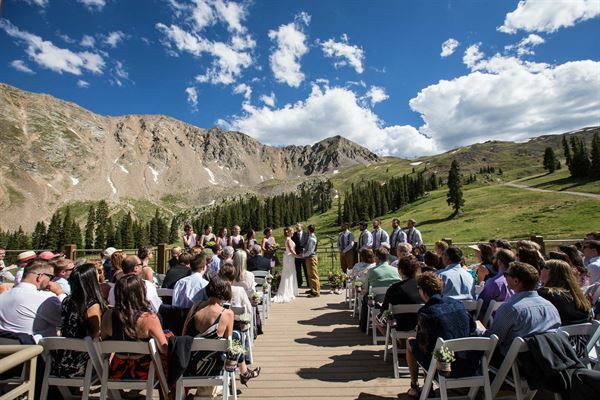 Arapahoe Basin's Black Mountain Lodge provides the perfect romantic venue for your Colorado wedding. Inside the mid-mountain lodge, high vaulted ceilings supported by immense raw cut timbers rise above the spacious dining room where towering windows offer you and your guests incomparable views of the Continental Divide. Outside, the lodge's spacious deck extends above the mountain terrain and is the perfect setting for you and your guests to enjoy light hors d'oeuvre and to hold your entire wedding ceremony - all at 11,550 feet above sea level. Dinner Package includes: ? We operate on a minimum food and beverage expense requirement. ? Couples can meet that minimum with hors d’oeuvres, dinner and bar service. Please contact us for exact pricing and fees. 1st floor of the A-Frame lodge; accommodates approximately 100 guests. Second level is available, if needed, at no extra charge. Black Mountain Lodge accommodates up to 200 guests for your special day. Vaulted ceilings, timber and stone design elements and towering windows adorn the interior of this romantic mid-mountain venue. Our lodge provides convenient spaces for your ceremony and reception, eliminating the stress of switching venues during your day. Transform our room to your specifications – leave space for dancing or create a special space to cut the cake. Cocktail hour can be held outside on the front patio next to your ceremony space. Celebrate your union outdoors on our spacious Black Mountain Lodge deck with stunning views of wildflowers and the Continental Divide serving as your backdrop. Travel to and from your venue via the Black Mountain Express lift for your procession, a quiet moment with your spouse after the ceremony, or load your entire wedding party for a unique photography session. Our dedicated wedding coordinator and event staff are available to manage your itinerary, organize you procession and set up your ceremony and reception areas. 2nd floor of the A-Frame lodge; accommodates approximately 55 guests. Located above the 6th Alley, Marnie's has a balcony overlooking the music stage on the main floor, a small private bar, room for catering and access to The Perch. outdoor, weather-protected venue at the south end of the A-Frame; accommodates approximately 100 guests. Perfect for casual events and parties with spectacular views of the mountain and surrounding areas.